Sweet Holiday Gift Ideas From Harry & David! The start of November means the Holidays are approaching, your loved ones are busy scheduling their parties, and many happy occasions and gatherings are in the near future. That being said, it also means it’s high time to prepare your gift list! Unfortunately, you have run out of creative ideas, but you still want to give gifts that will mean something special, and will be more lavish and impressive than ever before. Keep in mind, you will most likely have to purchase many gifts in the months ahead, therefore you need presents at affordable prices that still make a statement. What could be more meaningful than a truly heartfelt gift for your co-workers, your relatives, or friends? You want to express your appreciation for those important people with a wonderful holiday gift, but where can you discover gifts that declare “thanks for everything you are”, while still appealing to different people with significantly different tastes? Lucky for you, I have the solution: the answer to this unsettling question is undoubtedly, gifts from Harry & David! To make your life easier, I will present you with some different gift basket ideas that I’m confident will please everyone on your list. Chocolate is a universal taste sensation. Almost everybody loves to treat themselves to a piece of chocolate, whether it’s after a long stressful day, or to sweeten the hardships of life; it’s a true comfort food! Also, it’s a romantic gift, an expression of love and care. What better way to show your love and appreciation than with this tasteful Holiday Chocolate-Covered Strawberries Box with a beautiful flower bouquet of red roses? It’s the ideal gift for your significant other, or your bride to be. 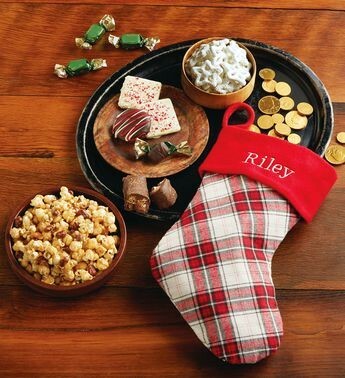 This is a great gift for just about any occasion that’s full of rich flavor, colors, and love. 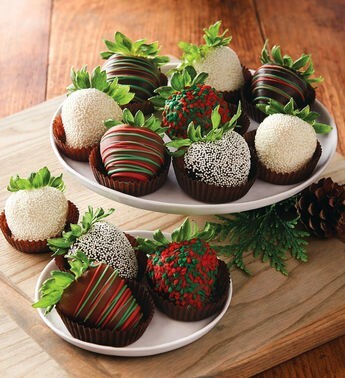 Fresh, juicy strawberries covered in decadent Belgian chocolate is really all you need! Your valued colleagues, who have helped your department flourish and your business to become more successful, deserve special recognition in the form of a ‘WOW’ holiday gift. This festive, plaid Christmas stocking is a suitable choice, and can be personalized with up to nine letters. It arrives with a bounty of treats that will surely help forge a stronger, more supportive team in your working environment! Send your best wishes to wine lovers with this Deluxe Christmas Basket with Wine! Upon opening the basket, they will discover delicious gourmet treats along with a bottle of 2014 Harry & David Ross Lane blend, a marvel of taste and a great culinary experience all in one festive box. On the other hand, friends that are dedicated to a healthier lifestyle would love the Deluxe Organic Gift Box, full of high-quality organic fruit and gourmet snacks. It’s simply the perfect treat of wellness with low calories to match! Lastly, I would like to highlight the ultimate Holiday gift that will surely make a lasting impression: the Supreme Christmas Gift Basket. 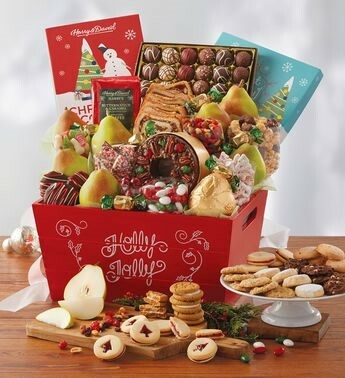 This abundant gift is filled with gourmet sweets, a marvelous Cookie Book, traditional fruitcake, and cookies. 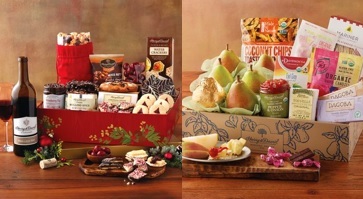 The wooden “Holly Jolly” crate will surely be reused and kept as a nostalgic reminder of family gatherings. All kids, parents and relatives will simply adore this memorable gift! The best part? All of these gifts can be purchased for under $100, so it’s easy to please all your friends and family without spending a fortune! Enjoy the deep appreciation and gratitude that you will receive for these stunning gifts, and make stronger bonds with the people you love. Make sure to stop by Harry & David and take a look for yourself, and don’t forget to take advantage of our exclusive 20% off $75 promo code to save even more on your purchase.